RHYS: I always find it fun to read the other 'what we are writing' posts. Mine could be about any number of things: I sent off my latest Royal Spyness book to my editor at Berkley a couple of weeks ago. it's called MALICE AT THE PALACE and is focused on a real royal scandal in the 1930s. I'm currently working on a Molly Murphy Christmas book, due out next Christmas. It's about two street children in New York, and my working title is NO CRIB FOR A BED. My editor isn't so sure she loves the title. What do you think? Any other suggestions? But I'm not going to share that with you today, because I have yet another project that is about to come to fruition. I have written a children's book with my daughter Clare and it's about to make its debut on Amazon, every other e-format, and also as a paperback. 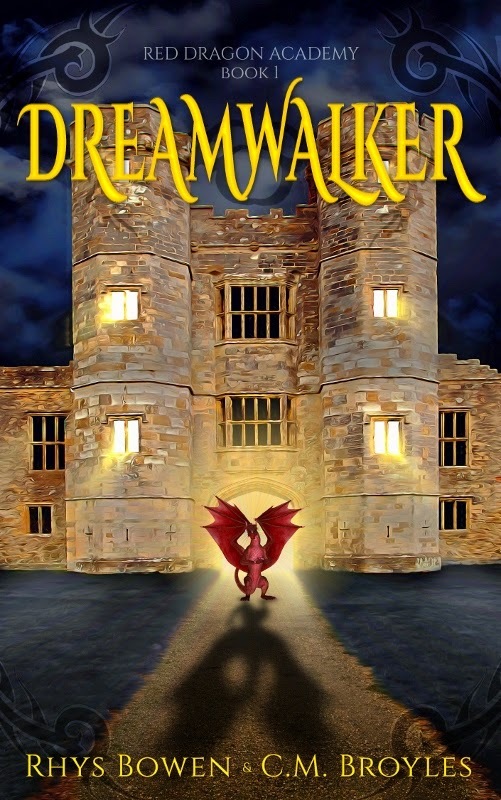 It's called DREAMWALKER, and is the first book in the Red Dragon Academy mini-series. It's a middle-grade fantasy in which California girl Addy finds herself enrolled at a strange boarding school in an old castle in the mountains of Wales where one corridor leads not to another wing of the school but to a mirror world with an evil ruler who can control minds. Addy has always had vivid dreams but now this power makes her a target for the ruler who calls himself The One. I’ve never been so cold in my life! It's freezing up in this tower. The cold from the massive stone walls bites into my back as I sit here hugging my knees to myself. The turret room is pitch black except for a sliver of moonlight coming in through the slits in the wall. Raj would probably tell me their name and that that they are where archers shoot their arrows, but Raj isn’t here. I wish he was. The windows are overgrown with vines and they cast creepy shadows like long tentacles on the round tower wall. I can make out the shape of other kids sleeping on the floor. They are lying as far away as possible from Pippa and me because they’re afraid of us. A bone-chilling howl comes from the forest. I know what animal made that howl and wish I didn’t. So a Rancur is close by and that must mean that the Fallon Gywn are with it. They’ve come for us. I huddle closer to Pippa. She seems to be sleeping, in spite of the cold. I prod her and whisper, “Are you asleep?” and she only grunts. A boy is whimpering and moaning in his sleep. How can they sleep at a time like this? There is no way I’d allow myself to fall asleep tonight, even if I wasn’t afraid of dreaming. I can’t stop thinking about tomorrow and what horrible thing is going to happen to us. No one will say exactly what it is, but I can tell it’s pretty bad. For once I wish this was a dream, but I know it’s very real. Was it really only a month ago that I was an ordinary seventh grader in California, surfing and going to the mall with friends? I had nothing more to worry about than getting my homework done. Then my mom died. That messed me up so badly I don't know if I'll ever be OK again, but that wasn't when the danger started. The danger started when I first walked down that dark hallway and found myself in this world that I don't understand. Or maybe earlier. Maybe it started when I arrived at crazy Red Dragon Academy. No -- even that wasn't right. The danger started in my own living room when I saw the two old ladies. The danger started when I climbed onto the back of the red dragon. So if you have a child who loved Harry Potter, this might make a good holiday gift. (Or if you loved Harry Potter and want to read something with the same feel). Anyway, it should be up and available on Amazon and other sites both as an e-book and a paperback by November 15. Let me know how you like it! Breaking News: Since I posted this my design guru has given me the links. You can read a bigger sample and decide if you want to buy the e-book right now. The paperback is available right now on Createspace but will be up in 3 drays on Amazon. Go forth and buy, my children! Confession: I have always adored fantasy and still re-read Harry Potter, the Lord of the Rings and even the Lion, the Witch and the Wardrobe. How about you? Do you read children's books? Wow . . . what an intriguing opening. Now I really want to read the rest of the story! Yes, I definitely read children's books; how exciting that you've been able to write the book with your daughter. I's sure the Red Dragon Academy books are going to be a big hit. I kind of like "No Crib For a Bed" . . . . I've returned to my love of middle grade books recently and actually read more fantasy over there than mystery. I'll definitely be on the lookout for your new book. Add me to those who like No Crib for a Bed. Middle grad fantasy! WOW! Go RHYS!! I love it. And I'm a huge fan of kids' books, cut my teeth on the Oz books and read and reread Harry Potter as a grownup. My Anne of Green Gables is thoroughly dog-eared. What fun Rhys--you never cease to amaze us with your productivity! Wonder how it was writing with your daughter? Another vote for liking No Crib for a Bed. Yes, I read "kid's books." I've read Harry Potter so many times some of my books are coming apart. I have a lovely boxed set of the Chronicles of Narnia and a Lord of the Rings set in hardcover my dad gave me in 7th grade (might be time to re-read those). My son and I both enjoy Rick Riordan's books, especially the ones based in Greek/Roman mythology. I love fantasy. Diana Wynne Jones is a top family favorite. My husband and I read her well before we had children as an excuse! This sounds like there are "pleasant" dragons (not "rip all humans to bits on sight" dragons) here. One of my favorites, too. I, too like No Crib for a Bed. Ooooh, this sounds amazing! I'll be getting it for the Kiddo and we'll be reading together! Rhys, I love it! Will buy next week! And yes, you know I love all the same fantasy novels, and reread them. I have a particular fondness for the English "door to an alternate universe" stories. Did you ever read a fabulous series by an author called Joy Chant? Oh, and I like No Crib for a Bed! I am definitely looking for that book! Yes, I DO read books for kids, especially fantasy, but regular fiction as well. I reread some of my favorite childhood books pretty regularly. How wonderful that you are writing this series with your daughter! Congrats on having so many projects going! We love your writing so bring it on! I loved Lloyd Alexander's Chronicles of Prydain as a kid and hope to re-read soon. I'd also like to re-read the Laura Ingalls Wilder books. I get very concerned that kids these days -- even though they have much more options in reading materials than we did -- won't get to enjoy the children's classics. As always, it starts with parents who read and THAT is a scary thing too. PK, I adored the Lloyd Alexander chronicles and am introducing them to the Kiddo -- never fear! I'm also looking to rereading Madeleine L'Engle's novels with him. What a great thing it must be to collaborate with your daughter! I've always envied the Todds even though I can't imagine working so closely with my son on anything. We're too much alike. I've enjoyed The Lord of the Rings books and have read them several times, as well as C.S. Lewis and Phillip Pullman’s His Dark Materials trilogy. Looking at those examples, it seems the ones I like are all fantasy. But I do in general enjoy books with younger protagonists or featuring a younger character in a pivotal role - The Case of the Journeying Boy by Michael Innes, The Rising of the Moon by Gladys Mitchell, and more recently Reggie Chase in Kate Atkinson's When Will There Be Good News. "No Crib for a Bed" sounds great to me, too. I'm another vote for No Crib for a Bed. Rhys, I will absolutely be reading Dreamwalker. I read children's, YA, and teen books along with all the adult books. I read them with my granddaughters, but I also read them because I like them on their own merit. I love that you've brought your homeland of Wales into the story. Dreamwalker sounds like a great middle school fantasy, with the excerpt already hooking me. An old castle, mountains of Wales, and a freezing tower. I'm in! So nice that you and your daughter have partnered in this series. I have a feeling it's going to catch on quickly. Of course, I'm excited about the next Georgie and the next Molly, too. When do you sleep, Rhys?